With two Rytmik titles already under its belt, Czech developer Cinemax is getting ready to launch the third instalment in the franchise, and following Rytmik: Rock Edition, musically-creative gamers can look forward to something with a little more Hip to the Hop. The Rytmik: Hip Hop King user-interface will instantly look familiar to users well-versed in previous releases. Users will have four tracks to compose songs by combining pre-installed clips: utilising drums, percussion, bass, melodic instruments and scratch samples. The in-game library bank contains 128 sound samples to play with, and several effects which they can apply to their instruments. 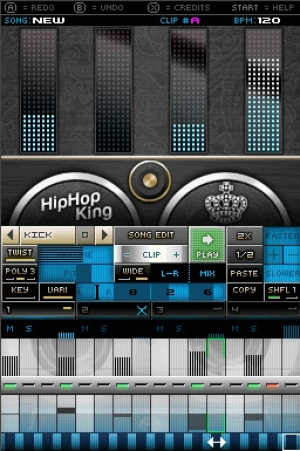 With Rytmik Hip Hop King you can quickly and easily create the basic building stone – an audio clip. It consists of musical notations for up to four instruments that you may transpose, select their location in the stereo field, and modify their volume, reverse, shuffle (rhythm twist) and polyphony (with extended polyphony handling), chorus/widening stereo effect and echo. You may arbitrarily combine up to 128 such clips in four tracks and create complex pieces of music. Moreover, you have a collection of 11 pre-made compositions at your disposal from which you may quickly compose your own pieces. Release dates have yet to be confirmed, but Cinemax has revealed that the DSiWare application will cost 800 points. To get a feel for what can be composed on Rytmik Hip Hop King, head over to the official game website where the music player has 11 different tracks available for your listening pleasure. I'm not a big hip-hop fan but I think its strong emphasis on good beats should suit Rytmik well. We'll soon see! That's what I like about Rytmik, they add new features without changing the layout of the program. lolz at the quote "It's bigger than...HIP HOP HIP HOP!" I'm not much of a hip hop fan, but I like that Cinemax is experimenting with different genres so that there is something for everyone. But Rock and Dance are enough for me at them moment. This one looks pretty awesome! I had a listen to the songs. They sound really good. The hip hop genre seems like it would suit Rytmik really well. I got Rock edition, and that worked for me. Not sure if I'll get this one... but like edhe said, if they released a chiptune one, I'll spring for that. They should update previous versions with the newer features.